3,995.7 8:15 Leave camp ... turn right on University ... 64°. Before heading out of town we went to the lookout at the university, but clouds entirely blocked the view of the mountains. 8:28 Back at University - turn right. 8:30 Turning left on Johansen Expressway. 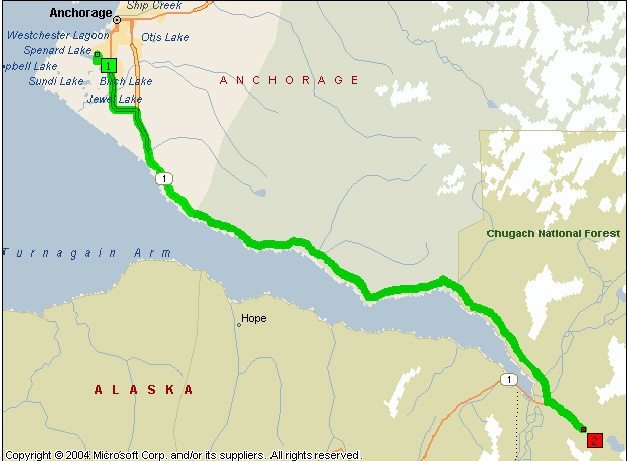 8:35 Turning left on Steese Highway (AK-2) ... Livengood 76 miles. 8:37 Crossing Farmer’s Loop Road, which continues north from University Avenue and winds east through the hills. 8:42 Crest after climbing out of the valley into the hills north of Fairbanks. 8:45 Passing the turnoff for Gold Dredge # 8 - National Historic Site. 8:46 Stopped at a temporary traffic light for road construction and single-lane road, then continuing on the green light. Sign for Permafrost Tunnel Research Area. The day is partially cloudy with some blue sky and the sun shining. 8:46 Leaving Steese Highway and continuing on the Elliott Highway ... cloud is cloaking some hilltops. 8:54 F (Fairbanks) 5.5 - Hilltop Truckstop ... next service 118 miles ... frost heaves - the road not in the best of conditions, but at least it is paved so far ... fireweed blooming along the roadside. 9:00 F 11 - Crossing Chatanika River ... the road is winding through dense forest as it goes uphill and down dale. 9:06 Crest and a steep descent overlooking a vast forested valley. 9:08 F 18.5 - Crossing Washington Creek ... the land is heavily forested but for most part the trees are not very big. There are parking areas at regular intervals. 9:14 Top of a hill and posted speed limit 40 mph for a sharp corner to the right. 9:15 40 mph for a sharp curve to the left. 9:16 Roadwork and a flagman for a single lane. 9:20 Pulling off (see MP p. 504 - F 27.7 ... White Mountains and Wickersham Dome). 9:22 Entering Livengood - Tolovana Mining District ... Dalton Highway 46 miles. 9:24 F 29.2 - Dog Sled Rocks up on peak ahead as we come around a corner ... also a patch of snow. 9:26 F 30.3 - Leaving Fairbanks North Star Borough ... there seems to be lots of 40 mph corners. 9:28 Large burn area way over to the left. 9:28 Steep descent into a deep valley ... also a good view of the pipeline - this is the 800-mile long pipeline which runs from Prudhoe Bay to Valdez. 9:31 Bottom of the descent (maybe) ... another steep descent! 9:33 F 37 - Crossing Globe Creek, then climbing ... Alaska cotton flowering. 9:34 Rocky outcropping to the left (see MP p. 505 - F 39 - Grapefruit Rocks). Often after reaching a crest there are distant views over the trees and the hills. It is truly a vast land. 9:40 F 42.9 - turnoff for pipeline pump station No. 7 - not visible as we pass by ... lots of good sized trees in a birch forest. 9:42 Can see the pipeline to the left and snaking up the hill. 9:43 F 44.9 - Crossing the Tatalina River, a tributary of the Chatanika which we crossed earlier. 9:44 Muskeg both sides of the road. 9:45 A large quarry or borrow pit to the left. 9:48 F 49.5 - sign - “Welcome to Joy, AK”, pop. 13 people, 67 dogs (MP p. 504). 9:52 View to the right of the White Mountains. 9:53 Steep winding descent ... two cyclists, one an older man and a younger one wearing a hat with a mosquito net ... snow patch at the bottom. 9:55 Alaska cotton and blue flowers. 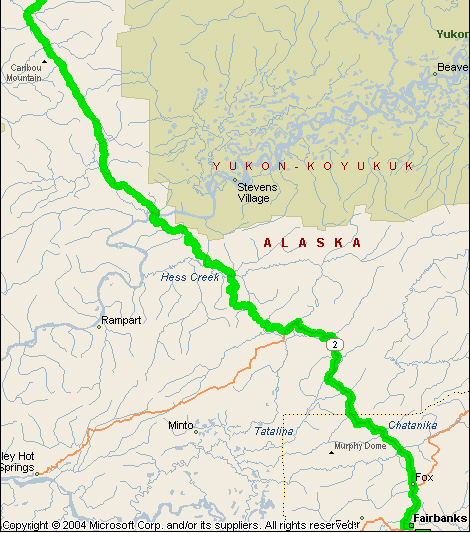 9:56 F 56.9 - Dalton Highway 14 miles, Yukon River 72 miles. 9:57 Crossing Tolovana River and interpretive sign. 10:00 Another cyclist (an oldy). 10:01 Muskeg ... BLM cabin (see MP p. 505 - F 62.3) ... hills and trees go on for ever! 10:04 Roller coaster ahead of us on a straight stretch of road. See MP p. 506 - F66 - Livengood, pop. 32, 31 homes on 265 square miles of land. 10:05 Passing North Mercantile Co.
10:08 Crest and steep descent ... distant view to the left of the road and possibly the pipeline. 10:10 F 70.1 - Livengood Creek, Money Knob to the northeast ... Livengood 2 miles to the right - No Services. 10:12 Crest followed by a steep downgrade. 10:13 F 73 - junction of Dalton and Elliott Highways, the Elliott Highway continuing on the left fork to Minto, 40 miles, and Manley Hot Springs, 80 miles. 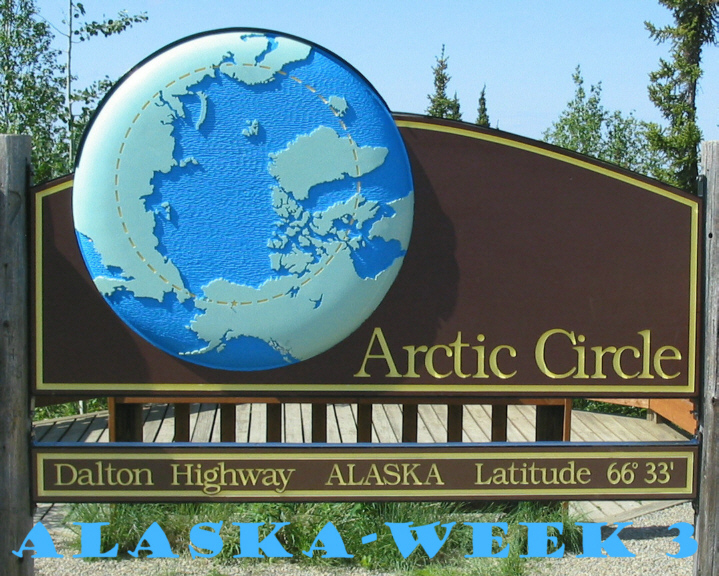 The Dalton Highway begins here, going north to the Yukon River, 56 miles, then continuing to Coldfoot, Arctic Circle and Prudhoe Bay. This is also start of the gravel road, very much like a washboard - the signed speed limit - 50 mph ... I don’t think so! 10:15 View of pipeline ... bluebells and roses flowering. 4,084.4 10:17 Mile 2 of the Dalton Highway (AK-11) ... mileages in this section are given as “J”, the distance from the junction of the Dalton Highway with the Elliott Highway. See MP pp. 507 - 509 about the highway. J 4 - MP p. 210 - “Five Mile Hill” into Lost Creek valley. 10:20 25 mph corner and steep descent. 10:23 Road to the right with closed gate leads to pipeline which must have gone underground somewhere. 10:24 Gravel pit to the left and the road is built up. 10:26 Passing a grader ... Alaska cotton. 10:28 Dandelions still doing very well ... Alaska cotton, roses, fireweed. 10:30 Moose to the left ... bluebells. 10:32 Burn area ahead (see J 15 MP p. 510 - Erickson Creek Fire). 10:34 Another steep descent sign - we are going down a lot more than we seem to go up! 10:36 Milepost 12 ... there is still forest but not as many trees. 10:39 Blue - bluebells, yellow - dandelions, pink - rose ... very colorful. 10:41 The road, hedged in by trees on both sides, is not visible far ahead - it looks as if it will drop off the face of the earth! 10:42 Masses of wildflowers to the right under burned trees. There has been a hazy look over the hills and the mountains - they could be called The Blue Mountains as they have that same look as the mountains of that name in NSW, Australia. 10:47 J 18 - Road construction for the next 4 miles. 10:48 Paved road ... 5 to 6 layers of blue hills. 10:50 Picture from the car window. 10:51 - 11:01 J 21.3 - Pictures of distant views and flowers ... evidence of the 2003 Erickson Creek Fire ... Sam walked in among the trees looking for Alaska cotton. 11:02 Steep downhill grade for the next 3 miles ... continued to see evidence of the two-year old fire ... grass and flowers underneath the trees were prolific. 11:04 The road narrows and the pavement ends ... steep descent ... the pond or lake at the bottom is a beautiful blue. 11:05 J 23.9 - Crossing Hess Creek, a pretty big creek ... the largest stream between the junction and the Yukon River ... MP p. 510 at J 23.8 mentions a side road 0.2 miles west to a pond - this must be what I saw from the top of the hill. 11:07 High rocky cliff to the left. 11:08 Pictures of the pipeline. 11:10 J 25.5 - Yukon River 31 miles, Coldfoot 150 miles (distance to the Arctic Circle is not given on the marker, but by my atlas it is 60 miles beyond the Yukon River. 11:12 & 11:13 Pictures of the pipeline. 11:26 Rocky cliffs to the right and a white cross ... road is being graded. 11:28 J 32.7 - See MP p. 510 about permafrost and pingo. Not to be confused with Pingu or Pinga (disambiguation). A pingo, also called a hydrolaccolith, is a mound of earth-covered ice found in the Arctic and subarctic that can reach up to 70 metres (230 ft) in height and up to 600 m (2,000 ft) in diameter. The term originated as the Inuvialuktun word for a small hill. A pingo is a periglacial landform, which is defined as a nonglacial landform or process linked to colder climates. They are essentially formed by ground ice which develops during the winter months as temperatures fall. The plural form is "pingos". 11:30 Brown bog-type water at the side of the road. 11:37 Picture of pipeline where it goes under the road ...trees ... trees ... trees ... so many trees ever since entering the Canadian Rockies going into Banff. 11:41 Checkpoint closed - all vehicles. Reduced speed ahead ... over hill (crest) and at milepost 41 speed limit 50 mph, over the hill and down, down for I mile - steep descent with 35 mph corners. 11:45 Down, I think, then up. 11:46 An old bearded man going in the opposite direction on a motor cycle. 11:48 Winding road - 30 mph. 11:53 Summit with sweeping mountain views to the west - WOW. 11:54 Steep descent and distant view of mountains with snow on them. 11:59 Open area both sides of the road where the forest has burned and not all the tree trunks are standing, just low scrub. 12:00 Two pictures from the car. 12:02 Start of the steep descent to the Yukon River. 12:04 More pictures from the car. 12:05 J 54.2 - Crossing over the pipeline. 12:06 Arctic Circle 60 miles, Coldfoot 120. 12:06 - 12:07 Crossing the Yukon River, a river we have not seen since crossing it by ferry from Dawson City. 12:19 Back on the road - sign: Drive With Lights On. Leaving here note the change in vegetation (J 57) - boreal forests, boggy lowlands and tundra ... there are still some pretty tall trees, white spruce and birch on well-drained south facing slopes. 12:21 Burn area both sides. 12:24 Hot Spot Café ... rooms for rent ... Circle Gifts. 12:25 Highway crosses the pipeline ... also a gate across the road for Five Mile airstrip (3,500 feet long) - road closes for landing aircraft. 12:26 Gate at the other end of the airstrip. 12:28 Water, brown peat colored, at the side of the road ... there are mountains way over to the left. 12:30 Another motor cyclist going in the opposite direction. 12:34 To the left snow on the hills above the trees. 12:39 Mile post 70 ... Views of Ray River Valley and Ray Mountains to the left ... steep descent and can see the road and the pipeline in the distance ... back into stunted forest. 12:42 Steep descent to Fort Hamlin Hills Creek ... really stunted forest. 12:44 Steep climb up Sand Hill - the “Roller Coaster” (MP p. 511 - J 74.8). 12:45 Bog area and stunted forest (J 77) - low-growing black spruce - indicates permafrost near the surface and poorly drained soil. 12:46 A burn area and a steep descent ... this one “they” really meant steep. 12:49 Starting to cross a broad undulating area - not as hilly until the other side. 12:51 J 79 - No Name Creek ... pond lilies blooming on a pond to the left. 12:52 Severe burn area to the right with very little left standing. 12:55 Burn area ... flatter ... when there is a view of the hills they seem to be bald or bare! 12:56 A lot of standing water. (Sam was saying that it took a lot longer to get it through Congress than it did to build the pipeline - environmentalist were holding things up). 1:08 Downhill and a distant view. 1:10 Leaving (J 90.2) after pictures of the road and the pipeline jogs - zigzag design allows for flexibility and takes care of expansion and contraction which occurs with temperature changes and of earthquakes - see MP p. 511. 1:13 At the moment the road is straight and going up and down like a roller coaster ... Milepost 93 ... tundra ... a few tiny spruce ... dwarf shrubs. 1:18 The road is built up above the surrounding land and there are posts marking the edge of the road on both sides. 1:19 Passing Finger Rock (J 96 - see MP p. 511). 1:20 - 1:24 J 98.2 - Finger Mountain BLM Wayside ... a number of pictures. 1:26 A cyclist with a trailer struggling up a steep hill (this was just after the picture I took from the car. 1:28 More pictures from the car. 1:29 J 102.4 - Gift shop and cabin rentals on the left ... lots of ponds of water to the right. 1:31 Coldfoot 71 miles, Deadhorse 311, at which point the pipeline road is closed to the public - Prudhoe Bay on the Beaufort Sea is 10 miles beyond Deadhorse. 1:35 J 107 - site of a former pipeline construction camp - Old Man camp - but there are no structures remaining. 1:36 Snow to the right, then the road goes through a cutting and there is more snow on the northern facing slope. 1:37 Snow to the left. 1:39 9% grade for 2 miles ... Beaver Slide ... some steep hills again with a big valley. 1:42 A forested area ... also the road is badly broken up for a couple of miles. 1:46 J 113.9 - Fish Creek ... a man fly-fishing to the right. 1:48 J 115.3 - Distance marker northbound : Coldfoot 60 miles, Deadhorse 300 miles; southbound: Arctic Circle 1 mile (so we have crossed the geographical Arctic Circle, N 65°, without knowing it! ), Yukon 60 miles, Fairbanks 194 miles. A fifth of a mile later we turn east into Arctic Circle BLM Wayside - we made it! 4,197.9 1:49 - 2:28 ARCTIC CIRCLE - We took pictures of each other standing by the beautiful sign for the Arctic Circle, N 66°33' W 150°48'. We also read the markers about the seasons - the sun does not set on the summer solstice and does not rise on the winter solstice. Whilst coping with the vicious mosquitoes during our picnic lunch, there were also lots of butterflies fluttering around. I took pictures under the trees of some of the flowers and the mosses or lichens. From here we continued on the dirt loop road to look at the undeveloped camping area on the hill behind the wayside stop. 2:33 Leaving the camp site! 2:35 Back on the road, but we continued north ... Alaska cotton. 2:37 Crossing a running stream ... trees above Arctic Circle aspens as well as a few birch and spruce. 2:42 Incredible long distance view across the valley to the hills and mountains beyond. 2:45 Passing Connection Rock - see MP p. 512. 2:47 J 121.1 (I think) was the point at which we turned around for the return trip. 2:58 Back to where we turned into the Arctic Circle BLM Wayside. 2:59 Back at Fish Creek. 3:03 Bottom of Beaver Slide ... lots of patches of snow on northern facing slopes. 3:09 Pictures to the right from the car. 3:15 - 3:17 Stopped and took a number of pictures - just before Kanuti River (Milepost for pipeline 302.7). 3:21 Southbound - Yukon River 48 miles, Fairbanks 180 miles ... lots of Alaska cotton. 3:25 Rocky outcrops ... snow, dirty, on north side of rocks. 3:51 Range of mountains to the right. 4:05 Picture from the window. 4:11 Milepost 343.1 for pipeline. 4:15 Back to bluebells and roses. 4:17 J 61.7 - State of Alaska DOT Seven Mile Station. Sign on gate: STOP - AIR TRAFFIC ... runway immediately adjacent the road on left as we drive south. 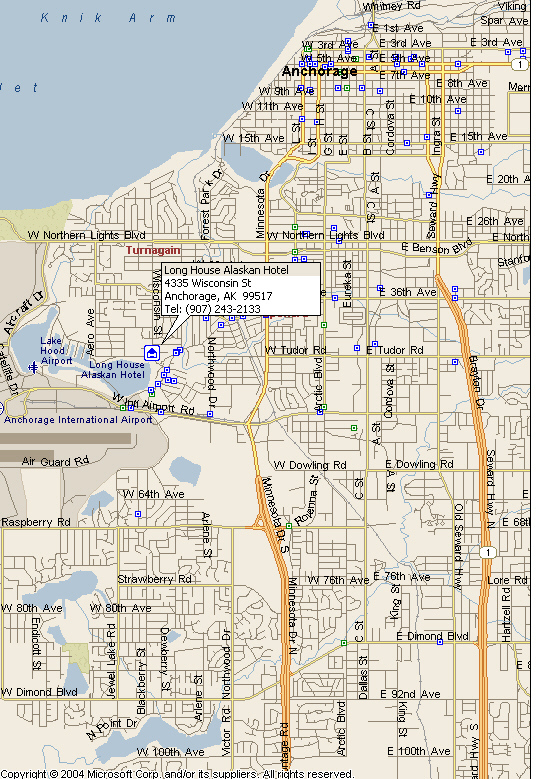 4:19 Passing Hot Spot Café (gas/lodging). 4:22 Approaching the Yukon River - pretty impressive as we come down the hill. 4:24 Leaving the highway at the BLM Yukon Crossing Visitor Contact Station. 4,270.2 4:25 - 4:58 Department of Interior Visitor center ... we talked to the volunteers manning the post and walked through the scrub to the river ... lots of flowers, bluebells, roses, shrubby cinquefoil, along the way, and since being home I have been excited about being able to identify one of them as an orchid. 4:58 - 4:59 Crossing the Yukon River (planking bridge) ... Fairbanks 132 miles approximately. 5:40 374.6 pipeline milepost ... Milepost 28 Dalton Highway. 5:48 Pavement! Sam said to Jo who was driving at the time, “Drive slowly, so you can enjoy it!”. It has been an absolutely glorious day, warm and sunny, and the views truly magnificent. Only in Australia’s outback could any one venture so far from civilization as we have done today. 6:24 - 6:30 Leg stretch and back exercise ... also Jo tried to wipe off what we thought was a thick coating of dust from the back window. No! We had been traveling on gravel road which had been watered to keep the dust down, and instead the window, and the rest of the car for that matter, had a layer of fine, clay-type mud adhering to it. Only a thorough washing would be able to remove it. 6:31 Crossed Livengood Creek ... What a difference being on the paved road! But then I wouldn’t have missed the Arctic Circle for anything. 6:40 Milepost (Elliott Hwy) 61. 6:43 Crossing Tolovana River ... fairbanks 66 miles. 6:53 Wildwood general store on the left. 7:15 Entering Fairbanks North Star Borough. 7:17 Four ranges to the left between us and the distant one and we have gone across all of them. 7:18 Entering Fairbanks Mining District. 7:26 Pipeline milepost 431.3 ... lots of fireweed starting to bloom. 7:33 Mailboxes ... means there is civilization. 7:37 House way up near the top of a hill ... lots of mailboxes by the road. 7:43 Lots of fireweed lining the road. 7:47 Going under a power line, another indication of civilization. 7:51 - 7:52 Red light for single-lane roadwork. 7:54 Divided highway with New jersey barrier at first, then a grassed median. 7:58 Passing the exit for Chena Hot Springs. 7:59 Around a corner and Fairbanks ahead. 8:01 Fairbanks - first traffic light. 8:02 On Steese Highway by Johansen expressway ... round and round and round!!. 8:09 - 9:32 Boston Pizza, where we finished up for supper ($22.45). 9:34 - 9:45 Fred Meyer - I bought some clear aloe to sooth bites ... from here we went out behind Wal*Mart and in front of Lowe’s to Johansen expressway, then west to University. 4,411.2 9:57 Back at camp ... What a day! I woke up around 7:45 (second time - first time was at 6:00 am). Both Jo and Sam were up and Sam had the coffee ready - I am so grateful for Sam’s dedication to making coffee each morning, but also to Jo for her aforethought in buying the coffee pot. Also whilst Sam was gone I paid for a third night at our present camp site ($22) and I took pictures of the irises. 4,411.9 9:57 Leaving camp ... went left on University and right on Airport Way. 10:04 Turning onto Discovery drive. 10:06 - 10:26 Discovery Trading Post where we bought our tickets for the afternoon boat trip on Discovery III ($44.95 each) and I got some postcards, too. We were to be back by 1:30 PM for the boat trip down the Chena River to the Indian Village on the Tanana river. The thermometer at Fred Meyer was registering 66°F - feels a lot hotter! 10:31 Turning left on University. 10:40 - 11:08 Geophysics Building - left my name, phone number and email address should anyone ever find any information on our old friend, Steve Geller. Judy Triplehorn, the librarian, was very nice and went out of her way to be helpful - just couldn’t get any information on Steve. 11:11 - 11:55 Georgeson Botanical Garden on the university campus, also baby reindeer. Then we went back past the Geophysics Building and the way we came. 11:58 Turning to the right - bridge over railway line. 12:00 Turning around to go in the opposite direction on Geist. 12:02 - 12:22 P.O. (M/C - $4.19 - Self - stamps) and after leaving, right on Geist. 12:26 - 1:18 Back at camp to have our lunch before going on the boat trip. 1:18 - 5:51 Discovery III boat trip, a wonderful way to spend the afternoon ... interesting to see the homes, a lot of log ones, along the Chena River ... entertained by small aircraft, including a float plane, taking off and landing. ... variety of presentations at Chena Village. On the return trip we were treated to crackers and smoked salmon dip - the Trading Post sells cans of smoked salmon - treated with brown sugar, honey and salt, smoked for 15 hours and hand packed - too expensive for my purse! The dip is made using 4 oz, cream cheese per can of salmon. We wander around in the Trading Post for a while before going on our way. 5:57 Junction with George Parks Highway and crossing the Chena River. 5:58 The exit for getting to Chena Pump Road. 6:01 Turning off for the Pump House. 6:02 - 6:54 Pump House Bar and Restaurant ... sat on the patio by the Chena River for a beer (Alaskan Pale Ale - M/C #5.43) ... the beer was good but the sun was hot! We took Geist Road back to University, went past the camp and across Airport Way to go shopping. 7:05 - 7:35 Jo and I shopped for groceries at Fred Meyer to stock up with supplies to last us for the next several days (we also bought a hot BBQ chicken to have for supper) - I paid for the groceries this time ($29.80). 4,437.1 7:41 Back at camp - end of the day ... Supper - BBQ chicken with a can of peas and a salad (lettuce, tomato, green pepper, carrot and crumbled guacamole chips ... after cleaning up from supper Jo and I decided to go for some Hot Licks Homemade Icecream ($2.75 cash). It started to rain while we were away and we came back to a thunder storm - no downloading would be done tonight! 4,443.2 End of the day (for the second time! I woke up about 7:15 this morning with Sam slapping the yellow cloth on top of the tent to mop up the moisture left from the rain during the night. I had slept well, but it was after midnight before I went to sleep - still daylight! Sam had the coffee ready and we had cereal and toast for breakfast. 4,443.2 9:30 Leaving camp we went a short distance on University, then turned left on Airport way to Cushman ... left on Cushman. 9:42 Stopped by the Tourist Information Center to take more pictures of the bronze monument, "Unknown First Family" in Golden Heart Park, in the hope of being able to pick up more detail in the faces..
Then we drove around looking for the “add-on” house. 10:00 Picture of “add-on” house. After this we wound our way through residential areas, noting a big variety of houses, old and new, nice gardens and some neglected (rhubarb seems to do well), huge lilac shrubs all blooming ... drove past library. 10:05 Back at and turning onto Airport way. 10:07 Turning off to the right and driving along the Avenue of Flags to Pioneer Park. 10:09 - 11:08 Pioneer Park ... a lot of original old historic log buildings brought together in one place, many now being used as speciality shops ... here also is the “Harding Car”, the railcar used by President Harding when he visited Alaska in 1923, and the steamer, “S.S. Nenana.”. Leaving Pioneer Park we turned to the right to get back onto Airport way - had to turn right on Peger, turn around and back to Airport Way because of a median. 11:11 Turning right on Airport way ... 72°F. 11:12 Can see UAF buildings on the hill from here. 11:14 Back as far as University Ave.
11:16 Turning into Discovery Riverboat ... buses waiting for boat to return - huge coaches - 12 buses altogether! 11:19 - 11:46 Discovery Trading Post ... ($25.72 - golf shirt, key chain and postcards). 11:48 Turned around to look for Jo’s watch rim. 11:51 - 11:56 Back at Steamboat landing, but could find nothing. As we go back into the city there is a sign: Welcome to Fairbanks - Golden Heart City and on the embankment is a floral heart with yellow flowers. There was also one of these as we came into Fairbanks from Delta several days earlier, but at that time I did not realized the significance of the yellow heart! 4,459.7 12 noon Goodbye Fairbanks - turning onto AK-3, Park Highway. 12:04 Back into a tree canyon, but there are homes tucked back in the forest. 12:05 Passing gas station, businesses and some “dumps” ... continuing to see places. 12:06 Passed Ester Camp Road - see MP p. 409. 12:07 Sign: Roadwork for 26 miles. 12:10 - 12:14 Stopped for roadwork ... when we moved off we were going very slowly, the pilot car putting out cones as we went along. 12:23 Still going slowly ... tall, tall trees and very skinny trunks. 12:24 End of the pilot leading us ... a lot of traffic was backed up in the opposite direction including a bus with the driver on the phone! ... extensive view to the right over the hills. 12:25 Great view to the left of the river below ... passing a viewpoint. 12:30 back onto gravel ... another pilot car and moving slowly. 12:33 End of pilot and end of gravel. 12:35 Great view to the right, then a big cutting made for the road ... big hills everywhere ... the river I am seeing is the Tanana. 12:39 Crest of a hill - a fairly long climb, then going down. Parks Highway goes west and southwest before turning south. 12:43 Another crest ... continually going up and down as well as winding around a lot. 12:44 Passing five cyclists going the same direction ... MP p. 408 - Mile F 23.5 - Murphy Dome with white communication installations on summit (not a telescope). We are getting some very distant views from this road regardless of which direction we are traveling, sometimes to the right, sometimes to the left and sometimes straight ahead. 12:51 End of double traffic fines. 12:53 Nenana 17 miles ... Sign: Shoulder work - Be prepared to stop. Again the vastness of the land absolutely amazes me, but I also know that Alaska is bigger than Texas, a state I have traveled north to south and east to west! 12:57 What a view! I am looking to the right into a vast valley. 12:58 We seem to be heading downhill and may finish up in the valley - lowland country with bogs and ponds - see MP p. 408 Mile F 43.3. 1:01 - 1:02 Pulloff ... Tioga van parked in the middle and we had to back out!. 1:03 A few houses along the highway. 1:06 Passing a tree farm on the right behind rows of trees along the road. 1:12 River to the right. 1:13 Bridge over the river - see MP p. 408 Mile F 57 and F 56.6. 1:14 Entering Nenana - MP pp. 407 and 408. 1:14 - 1:16 Stopped at the viewpoint of the bridge. 1:17 Over the bridge, last bridge over the Tanana River. 1:18 - 1:35 Nenana Visitor Center. Nenana, pop. 435, holds an annual sweepstake, the Ice Pool, second largest sweepstake in the world, second only to the Irish Sweepstake! What an interesting place! Sam was saying that he and his fellow workers in Juneau used to buy tickets and there would be twenty names on the back of every ticket. 1:40 - 2:00 Stopped near the Railway depot after driving around the town. (M/C - $7.27 - for moose pins). From the Depot Jo and I walked to the clock tower which registers the exact moment when the ice in the river breaks up. We also walked along the riverfront with its barge traffic and tug boats. What a fascinating town! 2:01 - 2:28 Back by the Visitor Center for a picnic lunch - ham, salami, cheese and lettuce sandwiches, carrots and soft drink. 2:28 Back on Parks Highway and continuing south. 2:29 Passing Airport Road ... Airport Lake by the road ... irises blooming thickly along the highway ... flat land which would be between the two rivers, the Nenana and the Tanana ... embankment to the right is quite sandy. 2:35 still seeing homes or shanties. 2:41 Starting to see some mountains on the horizon. 2:46 Muskeg ... lots of willow, but NO moose. 2:48 Ideal moose country! .... 79° F.
2:50 Healy 35 miles ahead and passing the turnoff for Anderson (see MP p. 406) and the road to Clear Air Force Station. 2:51 Mile F 79.6 - Denali Borough Landfill ... fireweed blooming along the highway. 2:54 F 82 - Clear Sky Lodge - food, phone and lodging. 2:55 Mesmerizing tunnel (canyon) ... roads going off into the trees - mailboxes and boxes for paper delivery. 2:58 Railway crossing ... campground to the left ... Tatlanika Trading Co. (See MP p. 405) ... Rex Bridge over the Nenana River - quite a current. 2:59 - 3:05 Stopped for roadwork - first car behind the pilot ... lots of daisies along the road. 3:07 End of the pilot. 3:09 Hills to the left and to the right ... the power line to the right has been running parallel with us for many miles. 3:11 Muskeg ... I guess that we are in among the hills which I saw originally! 3:13 Passing a Rest Area on the left. 4,506.2 3:15 Milepost 266 ... there are mountains, rather hazy, to the left. 3:20 Wide valley to the left ... scars on hills in the distance ... river running through the valley. 3:21 High cliff to the left ... What a shame it is so hazy. 3:22 The turnoff for Ferry ... the mountains are hidden in the haze. 3:23 A bit of snow showing up in the clouds ... it cools off quickly when the sun goes behind the clouds. 3:25 Starting to see some mountains ... the day is certainly clouding up. NOTE: Homesteaders - subsistence living - fish, hunt, contract work in summer for a variety of things ... ‘76 - ‘77 each citizen gets a check from the State - oil money ... that kind of income coming in. 3:26 Milepost 256 ... beige colored cliffs along the river on the other side of the river in the distance. 3:28 Opposite the rugged river cliffs and the road has become very rough, probably some frost heaving. 3:30 Crossing Panguingue Creek ... can see the heaving in the road ... black clouds are gathering - a big change in the weather. Who would have thought that we ate our lunch in hot sunshine! 3:33 Dry Creek - a wide creek bed and not a drop of water in it. 3:34 Driving through Healy (MP pp. 404 and 405) ... and the rain has started. 3:36 Going into the mountains. 3:39 Crossing Antler Creek - some water ... low vegetation on the slopes. 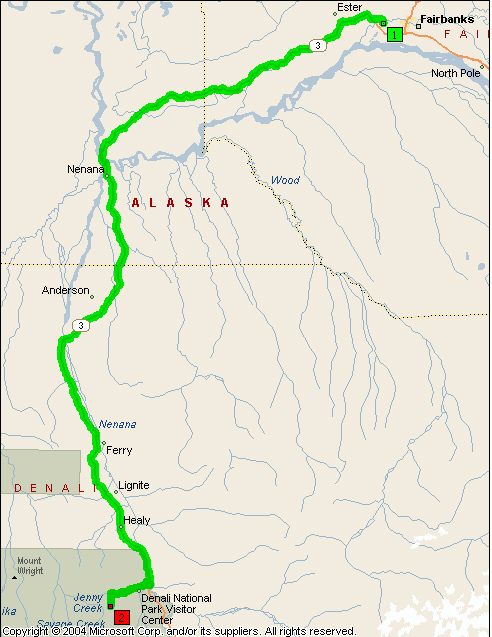 3:41 Wind area and crossing the Nenana river - MP p. 403. 3:42 Railroad is on the other side of the river which is to the right of the road ... very fast current ... rafters on the river ... we pulled off to see but there were none. 3:45 Back on the road ... stopping - to look at the railway bridge. 3:46 Back on the road. 3:48 White water on the river ... dangerous slide area ... very rapid river. 3:50 Pulled into McKinley Chalet Resort ... stopped for a side-dump truck full of dirt - truck rounded shaped on the bottom. We appeared to be in a “Tourist Capital” - lodges, gift shops, buses, cars - not our idea of fun! 3:54 Crossing the Nenana river again. 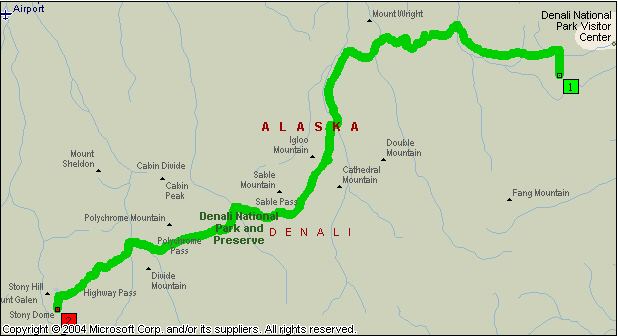 3:55 Turning into Denali National park, then turned into the Wilderness Access Center, referred to as WAC. 3:59 - 4:20 WAC for campsite information and bus tickets for the next day’s trip ... a very busy place with people constantly coming and going ... eagle. 4:24 Crossing the train tracks ... dark, threatening clouds. 4:28 Crossing Rock Creek, El. 2,030 feet. 4:40 Gravel road for about a thousand feet, then on pavement again ... sign for winding road for 2 miles. It is raining as we drive up to Savage River campground. 4:32 Crossed a fast flowing brown creek. 4:33 It is pouring. Sitting in the back seat I had been thinking quietly about sleeping in the car tonight, then Sam asked Jo, “What do you think of the idea of sleeping in the car tonight?” Jo replied, “I was just thinking the same thing!”. 4:37 Scattered spruce trees among the low vegetation which goes up the slopes a little way, then the mountains are bare except for a few snow patches. 4:40 Creek (braided) roaring down - very fast - then the trees become a little thicker. 4:41 Dry stream bed, wide and braided. 4:42 Back to a sparsely treed area. 4:43 Streak of lightning ahead! 4:44 Another wide creek bed. 4:45 Crossing a bog or muskeg area - no trees. 4:46 Mile 12.8 - Elevation 2,780 feet ... turning into Savage River campground ... lupines, bluebells, Alaska roses (yellow). 4:50 Backed into Site # 16. 4:52 Leaving to look around some more. 4,592.8 4:59 Back at # 16 ... and it is not raining at the moment, but everything is very wet. 6:01 Leaving to get something to eat after having set up the tent and taken out our night clothes ... everything else has to be kept in the car as a precaution from attracting bears. Sunset tonight, if we could see the sun, is some time after 1:00 am. 6:07 It is lightning, and there is an odd patch of blue sky ... crossing muddy (lots of silt) rushing streams. 6:11 Braided stream ... sun shining on snowy peaks to the east. 6:15 Brief stop at pullout for pictures. 6:23 Passing the Park Headquarters. 6:28 Roundabout ... crossing the railway line. 6:30 Turning into Riley Creek Mercantile. 6:32 - 6:37 Couldn’t get anything to eat ... found out that the showers cost $4.00 and a locker is $2.00. 6:39 On the Parks Highway and turning north ... lots of blue sky to the right ... raining. 6:40 Crossing the Nenana river ... rafting ... rapids. 6:44 Turned around after going uphill on Bluffs road by mistake. 6:46 - 6:50 Lynx Creek Grocery Store. 7:04 - 7:44 Subway (M/C $8.28). 7:47 Crossing the river (Nenana) - people still going down on floats. 7:48 Turning back into the park. Turned into Riley Creek Mercantile again to wash and clean teeth. 7:50 - 8:08 Toilet, cleaned teeth and looked around the store, then ready to return to camp. There were lots of people out walking in the rain. This time we drove in past the Visitor center (that is the new one). 8:32 Pulled over to look at interpretive sign, Sam doing the looking - I can’t see the sign from the car. 8:35 - 8:37 Stopping at the Savage River Bus stop, then continuing on along the road. 8:42 Turning into the Turn-Around Area overlooking the Savage River ... visitors to the park cannot drive beyond this point, and there is a guard house at the other end of the bridge over the river ... the river is brown and flowing very quickly ... buses which have been out to Wonder Lake for the day are returning. 8:52 Leaving for another overlook over Savage River. 8:56 Turning into the campground. 8:57 - 9:01 A bathroom stop! 4,627.9 9:03 Backed into camp. Jo and I walked to the bathroom, then down to the creek - saw about six different flowers and lots of lichens, but no sign of Mt. McKinley. It was beautiful down by the creek. Then we walked the loop road around the campground. Around 10:50 we saw the moon in one direction and the sun the other way when it peeped out from behind the clouds. I read until about 11:30 PM or so ... it was still daylight ... I still find it unreal to think that I am actually here in Alaska. A glorious morning ... I still slept with my sleeping bag as a blanket and was quite warm enough, though the others thought it was a cold night ... saw two rabbits this morning, also some birds. We walked down the road to the end of the campground and were rewarded with beautiful views. Mt. McKinley was visible from the end of the campground, like an apparition above the surrounding mountains, but did not show up in a photograph. 4,627.9 8:28 Pulled out from camp. We are driving down to the Visitor Center (or WAC) ready for our bus trip. The sun is already high in the sky (8:45 am) - only 5 more days to not setting - land of the Midnight Sun. 8:57 Parked for the day near WAC and ready for the bus trip into the park. We arrived early to line up for the bus, which was good because we were able to sit near the front and thus have a more comfortable ride in the bus (school bus). 10:10 Leaving from WAC on the bus ... the buses are operated by Doyan/Aramark Denali Park Alaska ... we had a good bus driver, Lisa Snow, who was both helpful and informative. 10:40 Savage River bridge, El. 2,780 feet ... 550 climbers on the mountain today ... trees sparse because of permafrost. 404,000 visitors to the park last year - 39,000 the previous year. 11:00 Passing bus stop, campground and Sanctuary River - flowing heavily ... 10 hours of rain yesterday. 7,000,000 acres of forest lost to fire last year. Teklanika Camp ... kettle ponds formed by big chunks of ice left by ancient glaciers. 11:15 - 11:33 Teklanika bus stop alongside a broad braided river bed ... bus line-up ... a circus, like an airport ... 10 minute pit stop! 11:35 Bridge over the Teklanika River. 11:43 Igloo Creek, El. 2,940 feet ... magpies. 11:45 Approaching Sable Pass ... stair step waterfall at the side of the road ... snow patches near the road ... the pass is like a canyon ... bear ... road clinging to the cliff high above the creek ... people in danger zone ... sign of nails, gnaw, scratch. 12:08 Leaving after watching light colored sow and her cub. 12:10 Incredible scenery ... reddish cones ... 5 white dots - Dall sheep. 12:27 Leaving another bear ... have seen 8 bears counting the cub. Big bank of snow along the valley ... the road continues clinging to the side of the mountains ... magpie. 12:40 Cabin in the bottom of the valley - is rented out to artists. 12:40 Another stop - moose to the left in the distance (mosse can jump 6 feet high fences). 12:43 El. 3,061 feet - crossing bridge - wide river bed ... Polychrome Hill ... there is nowhere to turn around and the road is so narrow I don’t know how buses pass. The bus is climbing high above the valley floor. 12:51 - 1:00 Pit stop. I changed CF cards ... Polychrome, El. 5,790 feet above us ... I don’t think that I would want to drive here! However, if I won the lottery to drive into the park, I don’t think there would be any stopping me! 1:05 Wild roses in bloom ... I would not want to drive here!! 1:08 Sprinkling of rain ... bare pointed mountains, almost look like huge badlands, to the right ... there is snow on the mountains beyond the valley to the left ... green ridge on the closer slopes to the left look like those on the mountains on Oahu after going over the Pali Pass. 1:20 Almost down in the valley again ... very rugged slopes to the right. 1:20 - 1:40 Toklat ... Dall sheep on the mountain slopes. Great variety of color in the slopes - orange, yellow, chocolate, gray, green, white, a wide range palette ... large variety of flowers ... gentle slope to the right ... low vegetation - tundra. 1:52 Cariboo lying on a patch of snow ... lots of flowers. 2:00 61 miles into the park. 2:07 Stony Dome ... more bear pictures ... shooting stars. 2:17 This is the place to see Mt. McKinley, but it is not visible today ... fortunately we had seen the mountain this morning. 2:20 Turning around and stopping ... 64 miles. 2:20 - 2:47 A wonderful break and I found it exciting looking for and finding so many different flowers blooming on the tundra. The time to leave for the return trip came all too quickly! For the return trip I am on the outside looking down over the valley! 2:51 Picture in the direction of Mt. McKinley. ... color bouncing off mountain minerals. ... trees lost bark in hard snow - porcupines ate high up the trunks and gradually lower as the snows melted. 3:20 - 3:40 Toklat ... it has rained since we were here. 3:41 Crossing creek, then the river - causeway between the two. 3:43 Start of climb (maybe) - No ... up then down! 3:47 Mosses and bluebells ... this is not the dangerous part of the road yet ... we are at the foot of the mountains to the left with an amazing valley to the right. 3:53 Climbing up the mountain with a steep drop to the right. 3:55 Pictures - didn’t come out very well because of window reflections. 4:00 Picture of kettle ponds. 4:10 Approaching the bear area. 4:13 Stopped for more wildlife. 4:20 - 4:32 Wolf ... we watched the wolf from afar off as it approached some shrubbery and retrieved a moose carcass ... guarding from other predators. 4:36 - 4:41 Cariboo and three bears. 4:45 Picked up two people. 5:03 - 5:15 Rest Area. 5:45 Pavement and crossing the Savage River ... rabbit. 5:47 Passing the turnoff into our camp ... (wide right of way - animals ... Creamers Field - 1800 acres ... 2,000 sandhill cranes). 6:10 Arrive back at WAC. What a truly wonderful day it had been, and it made me want to spend longer at Denali. It was very exciting seeing so much wildlife, and a special treat to see the wolf with the moose carcass. 6:24 Visitor Center - Book Store ... Morino Grill and Bar (M/C $10.95) ... watched the movie at the Visitor Center. 8:14 Leave the Mercantile after cleaning teeth. 8:18 Mother moose with twin babies by the railway tracks. 4,656.5 8:48 “Home” - end of the day. Rising early and finding it to be a glorious morning I walked to the end of the campground in the hopes of a better view of "The Great One" and I was not disappointed. 7:23 Passing the turnoff for the campground. 7:39 Turn around at Savage River. 4,663.3 7:46 - 10:33 Back at campsite ... had pancakes for breakfast ... went on two more walks for pictures before packing up camp and pulling out. 10:35 Back on the park highway. 10:39 Leaving after two more pictures of the mountain. 10:42 Three more (I think) pictures! 11:03 - 11:05 Railway depot ... 121 miles to Fairbanks, 223 to Anchorage ... there were lots of buildings on both sides of the main building each with the letters A - E on them and tons of bus parking. Before leaving the railway depot I noticed a sign which expressed something of what I felt about my visit to Denali but could not put into words. 11:13 - 11:33 WAC (Wilderness Access Center) gift store. 11:37 - 11:50 Visitor Center Book Store - Key chains (M/C $1796). 11:55 - 12:07 Riley Creek Mercantile - Cards (Forgetmenots) - M/C $2.99 ... From the Mercantile we went for a drive through the Riley Creek campground. 12:22 Passed the Denali Post Office and back on the road into the park. 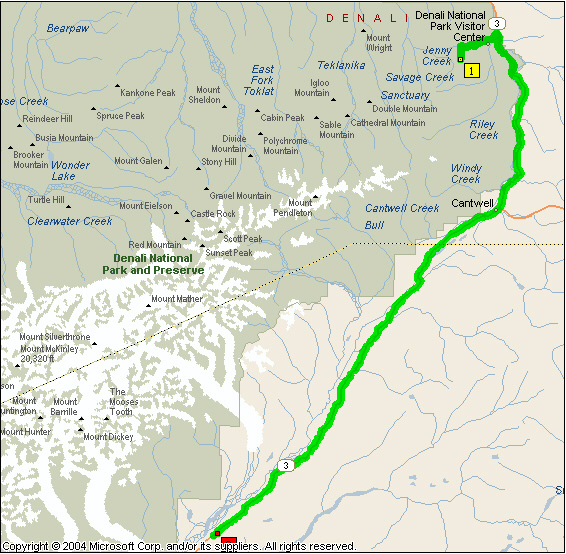 12:23 - 12:28 Entrance sign for Denali National Park. 12:29 Turning left (north) on Parks Highway to Denali Village ... “ALL SERVICES”. 12:33 - 12:40 McKinley Chalet Resort to look around the main foyer and photograph the Dall sheep ... attractive buildings in the village. 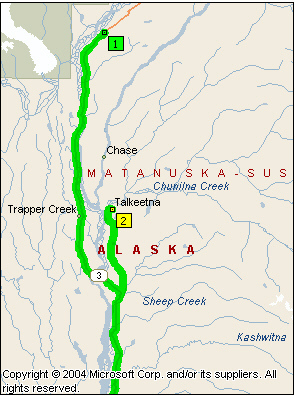 Milepost 238 is just before crossing the Nenana River. 4,684.2 12:43 - 12:48 Denali National Park and Preserve sign which was just after crossing the river. 12:49 Passing the entrance to the park and off we go, 65 mph, heading south to Anchorage ... Hess ... Hayes ... Deborah. 12:56 Crossing the Nenana River and passing McKinley Village on the right ... rafting to the left. 12:57 Dogmobile ... special pick-up with dog kennels. 12:58 A log gateway with a sleigh, dog team and musher across the top log. We are getting into more rugged mountains which are more heavily snow covered, but it is surprising how far green vegetation goes up the mountainside. 1:03 Hostels and lodges ... the road going through a valley, high peaks on either side. 1:04 Right alongside the Nenana River ... it is incredibly beautiful. 1:05 Steep rock avalanche slopes and only green to the top in places ... amazing valleys ... the river is very wide. 1:11 Crossing Nenana River ... I love the palette of colors on the bare mountain slopes. 1:12 A moose ducked into the trees from the roadside. 1:15 River to our right again. 1:16 Welcome to Cantwell - gas, cabins, lodges, café. 1:20 Crossing Pass Creek ... bald eagle ... view of Denali (Mt. McKinley) surrounded by clouds ... I was the first to see it. 1:26 Leaving Denali Borough and entering Matanuska-Susitna Borough (see MP p. 398, mile A 202.1 about Alaska’s boroughs - 16 in all) ... the largest is Juneau. 1:28 Very long lake to the left ... McKinley is in the clouds ... the white parts that aren’t moving are the mountain! 1:32 Picture of the mountain. 1:33 - 1:39 The mountain and glacier ... views (pictures) in every direction. 1:45 Mountain with “Hawaiian ridges” to the left at milepost 190. 1:46 Just went over Broad Pass, El. 2,409 feet ... see mile A 195 MP p. 298 about the divide between the drainage of rivers to Cook inlet and to the Yukon River. Igloo gas station at milepost 191 ... 14 species of Alaska Cotton Grass. 1:48 Winding downgrade ... eroded bluffs to the east. 1:51 East Fork Chulitna River, full and fast flowing (to Cook Inlet, not the Yukon River, Broad Pass being the divide. 1:55 Big communications tower ... it is hard to realize that McKinley is not a cloud! 1:56 Steep descent into trees and losing the view of the mountains. 1:57 Honolulu Creek - very fast flowing. 1:58 Low point and rising again. 1:59 Beautiful view of the mountain. 2:01 - 2:19 Hurricane Gulch - MP p. 398 Mile A 174 ... good view of the mountain ... pictures of gulch and the bridge. 2:20 Back on the road and crossing then turning around, milepost 174, then back across the bridge and turning around. 2:22 Pictures from the bridge. 2:24 Lots of new ferns under the trees ... the mountain is so mesmerizing it is difficult to look at anything else. 2:26 I noticed a long ridge going up to the mountain on the left (of the summit). 2:28 Entering Denali State Park ... road is going downhill and we can’t see the mountains to the right ... trees too tall ... “Goodbye McKinley”. 2:34 Crossing another deep gulch (no name). 2:35 Turning off for Denali View North. 2:36 - 2:58 Denali View North was a wonderful stopping place ... 40 miles from Mt. McKinley peak ... Siberian Aster and Chiming Bells. 2:59 Back on the highway. 3:02 Wasilla 118 miles, Anchorage 160 miles. 3:05 “Goodbye” ... canyon of trees (or tunnel) with odd glimpses of the mountains to the right. 3:11 McKinley again briefly ... high green hills to the left with snow patches, but not the rugged mountains. 3:14 Another brief view of “The Big One”. 3:15 Turning off for Denali State Park and the Alaska Veterans Memorial. 3:17 - 3:37 POW MIA Rest Area. on leaving we went round and round because the map was difficult to read. 3:40 Back on Parks Highway. 3:41 Leaving the highway for Byers lake ... turning into. 3:44 Moss hanging from the trees. We are driving along the various loops throughout the campground trying to decide on a suitable campsite. 4:36 Tent erected ... Sam went to register ($10.00) ... site 3A on the Alder Loop ... elderberries flowering, also a profusion of red currant bushes. 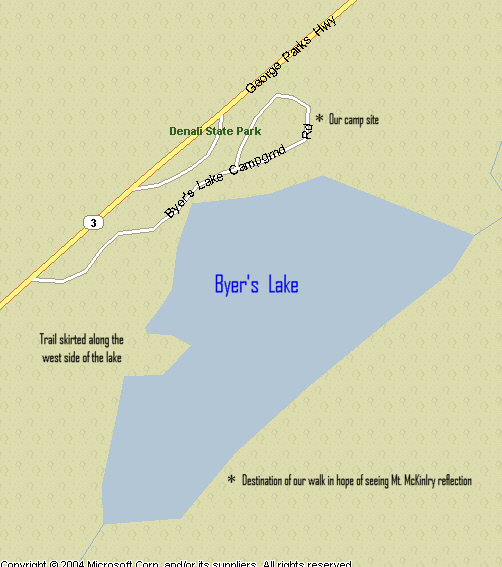 We then decided to walk along Byers Lake in the hope of seeing a reflection of Mt. McKinley. 4:39 Parked the car and set off for what was supposed to be a short walk! The mosquitoes were vicious making what would have been a wonderful walk somewhat unpleasant. Also I was very out of shape for such a long walk, an hour each way! Apart from these complaints it was quite delightful with various wildflowers, including wild geraniums and dwarf dogwood and some I have been unable to identify, blooming along the way. ... but the water on the lake was disturbed by the wind and this obliterated any hopes of seeing the reflection of Mt. McKinley. 5:35 The time when we turned around for the return walk back to the car. On our way back the grouse was sitting in the middle of the path and was not inclined to let us pass, but when she finally moved we saw that she was protecting four chicks. These scattered quickly and we were able to continue. 6:35 Back at the car. 6:37 Turning right on the highway. 6:39 Medal of Honor Road ... Purple Heart Lane ... from here a last look at the mountain which had given us so much pleasure throughout the afternoon ... Mt. McKinley looks very ethereal. 6:40 Turning back into camp. 6:42 Stopped at the well for water. 4,780.9 6:44 Backed in. Late supper - salad and a package of Zatarans with kielbasa. The long walk, which came to be known as a “Jo Walk,” wore me out... it was just a bit much and I need to be a little wiser next time ... it is like the mind is rearing to go but the body isn’t prepared ... I was in bed by 9:30 ... Jo and Sam were just wonderful. 4,780.9 8:37 Pulled out after packing up in the rain ... no breakfast. “Kids don’t float” - a sign by a line of life jackets hanging on a rail in the rain. 8:41 Junction with Parks highway and turning south. 8:44 First view of the closer mountains ... started out black and white in a gray sky. 8:45 Crossing Byers Creek (just after Byers General Store). 8:49 Anchorage 140 miles, Wasilla 98 miles. 8:52 Crossing Lower Troublesome Creek ... such appellations make one curious about the history of these names! 8:55 Food, Beer and Rooms - McKinley View South Lodge ... also just before that there was a Rest Area. 9:03 Start of a patch of muskeg. 9:08 Plugged in the camera to recharge the battery which was very low before we finished our walk last night. For the most part this morning we have been driving through a tree canyon. 9:11 Milepost 120 ... Wasilla 78 miles, Anchorage 120 miles. 9:17 - 10:17 Trapper Creek Inn and General Store ... great breakfast - 3 slices of bacon, hash browns, 2 eggs (sunny side up) and coffee (3 large cups) - $8.25 (incl. Tip). It was interesting listening to the conversations of the locals sitting around us! 10:28 Crossing Susitna river - huge and running a banker. 10:30 Lots of mailboxes ... must be getting closer to civilization! Sam says you can tell how long a family has lived in a place by the number of old cars - these are saved for parts. 10:34 Mile A 98.7 ... Turn off for Talkeetna - MP pp. 387 to 394. 10:35 - 10:43 Talkeetna Visitor Center ... 14 miles to Talkeetna, aviation and supply headquarters for ascent on Mt. McKinley ... 398 people on the mountain. On the left there is a lovely, paved bike path adjacent to the road. 10:51 Crossing Answer Creek ... Where is Question Creek?. There are lots of places along the way, some old and some new. 10:53 A pretty lake to the right. 10:55 Fish Lake to the right - very lovely and at the end in the distance there are mountains. So many places ... more beautiful log houses ... bike path continues. 11:00 Over a crest and around a corner - can see a huge river ... cross the railway tracks and enter Talkeetna, pop. 868. 11:02 Passing Latitude 62 Lodge/Motel ... Talkeetna Historical district. 11:03 Town is a hive of activity! ... Willow and birch stick fence ... lots of businesses for arranging scenic flights to, around and over the Alaska range and Mt. McKinley in particular ... so many flight services ... Talkeetna Roadhouse, est. 1944 ... Art galleries. 11:09 Left on 2nd Street to the airport, El. 358 feet ... so many planes - glacier landings and McKinley Flight Tours - Mt. McKinley rises 19,960 feet above the airport in approximately 60 miles! 11:16 Picture of planes ... still a pile of snow. 11:18 Back at Talkeetna Spur ... a passenger train arrived whilst we were at the airfield. 11:20 Turning off for the depot ... Holland America buses, also Princess - 6 or more buses. 11:26 Back on the Spur road and driving south. 11:42 Back at and turning onto Parks Highway. 11:43 Wasilla 56 miles, Anchorage 98 miles ... Sign: “Give Moose A Brake”. 11:45 Crossing Montana Creek (MP p. 387) ... there is a campground ... road has a wide right-of-way ... tree canyon. 11:48 Crossing Goose Creek ... the water in all these creeks is fast flowing ... of great interest to me is the fact that the salmon come so far inland from the ocean! 11:53 Crossing Sheep Creek - could be called a river. 11:54 Lodge - Gigglewood Inn ... also turnoff for Eagle’s Nest. Five-storey building, each level getting smaller as it goes up, the top or fifth level looking like a house! 11:57 Entering Willow ... It was voted in 1974 to move the capital to Willow, but such a move would have been too expensive - see MP p. 384. 11:59 Crossing Kashwitna River - very full and fast flowing. 12:03 A red wooden fence with big white paws all along it. Iditarod headquarters at Wasilla, but moved to Willow because of lack of snow ... a lot of dog kennels in this area ... MP p. 384. 12:07 Kashwitna Lake to the right - yellow pond lilies near the bank. 12:08 Little Willow Creek ... the fishermen are out there, not sitting in their cars! If only it would stop raining! 12:12 Crossing Willow Creek ... Willow Creek Resort ... bike trail to the right after passing the turnoff for Willow Creek parkway, the Fishhook-Willow Creek Road east to Palmer on the Glenn Highway. 12:13 Lake to the right. 12:14 The turnoff for the Willow Creek Community Center - where the Iditarod starts. 12:17 Getting into the outskirts of civilization ... a great show of lupines ... bike trail continues ... Wasilla 25 miles, Anchorage 67 miles. 12:18 Homes around a lake to the right. Parks Highway seems to be an excellent road with passing lanes varying from side to side on uphill grades. 12:24 Entering Houston - lovely wooden sign. 12:25 Passing Houston Roadhouse and motel. 12:27 Bike path begins “downtown” Houston. 12:28 Crossing Little Susitna River - pretty big today! 12:29 Bicycle path both sides of the highway ... the one on the left ends! 12:32 Passing the road into the Houston High School. 12:33 Big Lake turnoff ... more and more mailboxes are appearing at the various roads leaving the highway. 12:36 Meadow Lake - quite a built-up area. 12:38 Mile 49 Café to the east, BJ Center to the west ... some kind of fair supposed to be going on. 12:39 Traffic lights ... commerce at its worst - ticky-tacky to left of highway ... 62°. 12:42 Lake over to the right ... lots of businesses ... taxidermy with statues of bear, moose and Dall sheep on left. 12:43 Chainsaw carvings on right. 12:45 Turning right off the highway ... Best Western Lake Lucille Inn - a beautiful building with lovely hanging baskets on the shore of the lake. 12:51 Back passing the Best Western. 12:52 Back at Parks Highway ... Sam and Jo were here in October 2002 - they say it has blossomed since then, that is grown beyond recognition! 12:56 Lake Wasilla to the left (big lake) ... we sure are back in civilization, and a bit of a shock after all the wilderness we have enjoyed. 1:00 Alaska View Motel - where Jo and Sam stayed ... road construction - flagger. The car clock is about 5 minutes fast! 1:04 Start of divided highway ... it is Saturday and they are working, that is road construction continues even in the rain - they are paving. 1:08 Chugach Mountains to the left - it is still raining and the mountains just appeared in the gray sky ... Exit for AK-1, the Glenn Highway ... AK-3, the Parks Highway ends and we are merging with the Glenn Highway for the last leg into Anchorage. Since the junction with AK-1 the road is crossing a flat area. 1:12 Crossing Knik River ... clouds hanging low in the valley. 1:13 Crossing a third channel - very wide Knik River ... two seagulls balanced on a floating log. 1:15 Very marshy to the right ... though divided the road does not have controlled access. 1:17 A mass of irises ... and, to the right, someone stealing clumps of them! 1:19 Welcome to Gugiak ... after that we are back into trees ... It is NOT a nice day! Cloud is now completely blanketing the mountains from view ... controlled access after the irises ... the rain is really miserable - not nice for man or beast. 1:26 Still in Chugiak ... lots of daisies flowering, something we didn’t see much of further north. 1:30 Exit for Eagle River - rock cliffs at river’s edge ... highway 3 lanes each way. 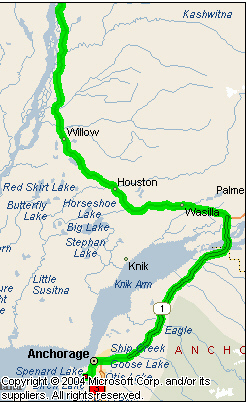 1:34 Moose next 7 miles ... before Wasilla and after Talkeetna there were numerous signs to watch for moose. 1:36 Exit for Fort Richardson and Arctic valley. 1:38 Crossing Ship Creek ... all the creeks and rivers are running bankers. 1:42 Start of traffic lights. 1:44 Anchorage Welcomes You ... going towards downtown on 5th Ave. ... there is quite a wind blowing. 1:54 Getting into downtown ... the Hilton is a big building ... horse-drawn carriages ... passing Captain Cook Hotel (been here a long time ... gorgeous hanging baskets. 1:56 Turning left on L Street ... Cook Inlet was straight ahead ... 9th Ave. ... Delaney Park - pretty flowers ... lilacs in bloom. 1:59 Rain a little lighter at present ... we are driving towards the airport. 2:03 Turning onto International Airport Road. 2:04 Turning right on Spenard road. 2:09 Traffic light at Minnesota Drive. 2:12 Turned around and going back on Spenard. 2:17 Turning right on Wisconsin Street. 4,971.9 2:18 Arrive Long House Alaskan Hotel - on Wisconsin just past Lakeshore drive - it is very expensive (over $200.00 with tax), but weren’t given much hope of finding anything better, it being the weekend for the Mayor’s Marathon. We were fortunate enough to get a double, non-smoking room (#128) on the first floor. Sam and Jo unloaded the car and have gone to have the car serviced. I have stayed behind to have a shower, the first one since last Saturday (!) and wash my hair. Now I am downloading all my pictures and will write them to disk. Whilst Jo and Sam were away they got gas. 4,988.0 6:50 Leaving from the Long House to go out for supper, Jo driving ... left along Wisconsin Street to Spenard ... turn right ... 65° ... left on International Airport Road. Whilst waiting for a light and looking along Airport Road there is a backdrop of mountains. Sign with a beautiful bed of flowers: Anchorage Welcomes You ... crossing Old Seward Highway. 7:00 - 10:15 Sourdough Mining Company and Alaska Wild Berry Products. We had dinner at the Sourdough Mining Company restaurant (I had halibut which I really enjoyed - M/C $26.40). After dinner we attended a presentation, “The Adventures of Dusty Sourdough” in Tent City adjacent the restaurant. Next we visited Alaska Wild Berry Products, looking at a lot of gift products, but I was most interested in the chocolate “waterfall”. 60° along Airport Road as we return from supper. Before going back to the hotel Jo drove around a lake with so many float planes along the shoreline, each with its own little shed. 4,997.2 10:30 Arriving back at the Long House ... end of the day. We spent the better part of the day in Anchorage - we didn’t even know whether we would be able to vacate our room at the Long House by noon. First we had to attend to laundry and the front desk didn’t have enough change for the washers and dryers! What a pandemonium! Whilst Jo and I attended to the laundry Sam dealt with trying to dry some of our camp equipment and pack the car. 4,997.2 11:39 We finally left from the motel and drove around nearby Lakes Spenard and Hood to see all the float planes on the lake. Also there are some very nice homes which look out on the lake. What a most incredible sight! It was hard to believe that we could even be driving there, but then I suppose that with so many small planes the owners have to have roads to reach their craft. 11:50 Stopped for a plane - “Trans Northern”. 11:59 Picture of the control tower. 12:02 Back opposite the Long House ... 62°. 12:03 Turning onto Aviation Avenue. 12:20 Leaving after pictures of float planes and sheds. 12:21 Turning left on Spenard, then left on Wisconsin and left on Lakeshore drive. 12:24 Neat signs, then planes with houses behind. 12:28 Muskeg to the left. 12:29 Left off Aircraft drive onto Northern Lights Boulevard. 12:30 Turning into Earthquake park. ... gooseberry bushes in abundance ... we walked through the park and took pictures of many of the interpretive markers. Most of the devastation from the 1964 quake is now hidden among all the trees which have grown in the area. 1:05 - 1:14 Cook Inlet Overlook ... we could not see Mt. McKinley ... float planes were coming and going. From here we went back along Northern Lights Boulevard. 1:16 Back past earthquake park ... hedge of beautiful lilacs, pink ones as opposed to the usual lilac color. 1:21 Turning left on Minnesota. This Wyland Whaling Wall is located on the east side of Anchorage's Town Square. Due to it's enormous size and smaller buildings right up next to it, it won't all fit in one photo frame. In addition to bowhead whales, it also depicts beluga whales and seals which are native to Alaskan waters. The artist Wyland is best known for painting similar whaling wall murals around the US. Along 4th Avenue there were beautiful hanging baskets with yellow marigolds and purple lobelia. 1:27 Bear right on 2nd ... big flea market between 3rd and 2nd. 1:30 - 1:52 Ulu Factory. From here we returned the way we had come. 1:54 Passing statue of man surrounded by eagle - Alaska Statehood Monument. 1:55 Fence with salmon swimming up. 1:56 Turning left on 4th. 1:59 Passing the Visitor center ... copper nugget. 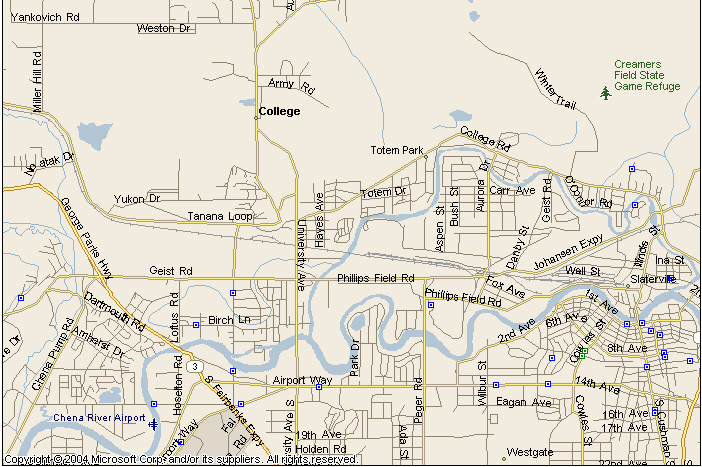 2:02 Turning right on “C” Street. 2:04 Back at 4th and “C” after going around the block. 2:07 Right on “E” Street ... Jo and Sam dropped me off so I could go to Grizzlys, a gift store I had been told about at the Ulu factory as somewhere I might be able to purchase the ulu recipe books. 2:17 Picked up by Jo and Sam ... down 3rd and turning onto “H” ... we are driving round and round for cell strength, that is enough signals for Jo to be able to use her cell phone. 2:25 4th and “I” ... totems by Courthouse. 2:28 Back at 4th and “E” ... 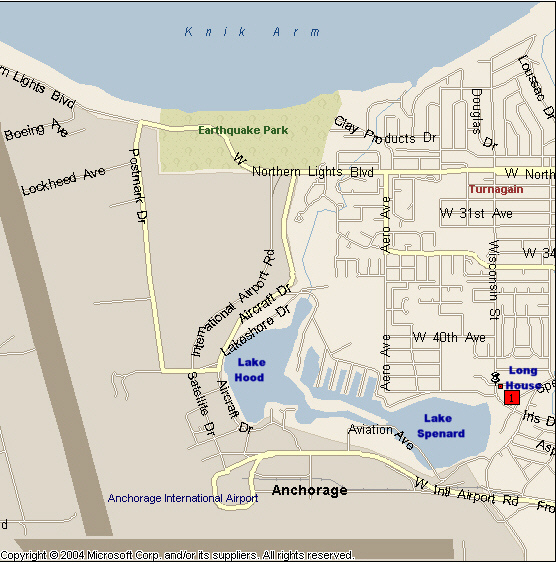 I am noticing some really neat stuff around Anchorage whilst Jo and Sam are talking to family on the cell phone. 2:34 Still on “C” and getting out of town ... waiting at Fireweed lane for the light to change. 2:35 Passing a big Wells Fargo building ... Appleby’s ... TGI Fridays ... Lonestar Steak House. 2:44 Turning left on Dimond ... Costco ... Toys R Us ... Best Buy ... Pier 1 Imports ... Office Max. 2:49 Wal*Mart to the right and Sam’s Club to the left ... it is like a zoo ... Sunday traffic and we are looking for a grocery store. 2:52 Turning back along Old Seward Highway. 2:56 Back at Dimond ... very long traffic lights. 2:58 Crossing Dimond and going back towards town - going north. 2:59 Turning around again and going back along Old Seward. 3:02 - 3:30 A & W for some lunch ($4.99 cash). 3:32 Going east on Dimond Boulevard. 3:34 I noticed a sign for GOLDER ASSOCIATES and should try to remember to tell Michael about this! 3:36 - 4:00 Fred Meyer - groceries (M/C $16.15) ... 77° ... leaving after doing our shopping we turned left on Dimond. 4:03 Waiting for the traffic light ... turning onto the new Seward Highway. 4:05 National Forest Scenic Byway ... 65 mph ... driving south on AK-1 (MP p. 520 - Kenai Peninsula). 4:09 The mountains ahead are on the Kenai Peninsula ... Cook Inlet is to the right, and it is raining ... the road follows the railroad. 4:10 Crossing Potter Marsh ... houses going up the hill to the left (MP p. 522). 4:12 Entering Chugach State Park (Mile A 11.8) and now you can look out above the railway line to Turnagain Arm ... rock cliffs to the left, the road, the railway and tidal flats along Turnagain Arm. 4:14 The road is winding around the base of the cliffs ... it is just beautiful. 4:18 Passing Beluga Point (Mile A 16.6 - MP p. 523) ... gorgeous views, BUT we did not stop! Jo said, “It’s just a viewpoint!” I was enthralled with the scenery and longingly wished we had more time to stop! 4:19 Passing another photo turnout ... there is a camera sign at these turnouts. 4:21 Hope (MP p. 523 - mile A 19.1) is across Turnagain Arm ... ... Resurrection Creek is in the valley and there is a trail from there to the other side of the peninsula. 4:24 A waterfall coming down the cliffs. 4:26 At this point we are away from the water. 4:28 Briefly back by the water by Bird Creek before going back into the trees. 4:29 Seward 98 miles, Homer 194 ... then back near the water - Turnagain Arm. 4:30 Big sandbars in the inlet ... the rain did not last, but it is cloudy with a few blue patches and the sun shining now and again ... there are many turnouts with interpretive markers. 4:36 Another sandbar ... glacier at the end of the inlet ... just one turnout after another, all with interpretive markers. 4:38 Huge sandbars - the sand is gray. 4:39 At least two glaciers to the left - MP p. 525. 4:40 Crossing Glacier Creek and sandbars continue ... bald eagle flying overhead ... p. 525 - ‘64 earthquake. 4:46 Sandbars practically right across the inlet ... the tide is out for sure! 4:47 Good view straight ahead of the glacier in the sun, but the mountains to the right are in cloud or it is raining. 4:49 Glaciers up a valley to the left ... mile A 46.3 - bridge over Twentymile River. 4:51 Crossing Portage Creek No.2 (A 47.6) and Portage Creek No. 1 (A 48). 4:52 Turning off the highway to the left for Portage Glacier and Whittier. 4:53 Entering Portage valley, Chugach National Forest. 4:56 Creek to the left, glacier to the right. 4:57 Williwaw Viewing Area and Williwaw campground ... again we drove around the campground looking for a suitable site. 5:06 Two hanging glaciers to the right. 5,077.9 5:08 - 5:09 Backed into site - $6.00 (half price with Golden Age Pass) ... set up tent and got water from well. I found a different flower (new for me) near our camp - Common Pink Wintergreen (Pyrola asarifolia). 6:10 Leave for a drive. 6:12 - 6:14 Stopped at gate to ask about ticket for the car. 6:15 Turning right at the highway. 6:17 Calving from a glacier on a lake and going through a small tunnel ... glaciers all over the place! 6:18 - 6:27 Scenic view ... standing at one point one can see 8 glaciers, including Portage Glacier. 6:28 Turning around just before the toll booth. 6:30 Back through the tunnel. 6:31 Turning off for the Visitor Center. 6:38 - 7:02 Parked by the lake near the Begich and Boggs Visitor Center ... Begich, congressman - speaker of the house, and Boggs, a commentator, were both lost in small plane ...Burns, Portage (around the corner - now have to take a boat trip on the lake to see this glacier) and Byron Glaciers ... mosquitoes as big as turkeys!! 7:08 - 7:11 Drove along another road near the lake but couldn’t see anything. 7:16 Turning back into the campground. 5,087.9 7:19 Back at camp ... we are virtually camped below a glacier, Middle Glacier ... now it is time to finish preparing the camp and get supper.